Inaugural Standards of Professional Practice Institute A Success! 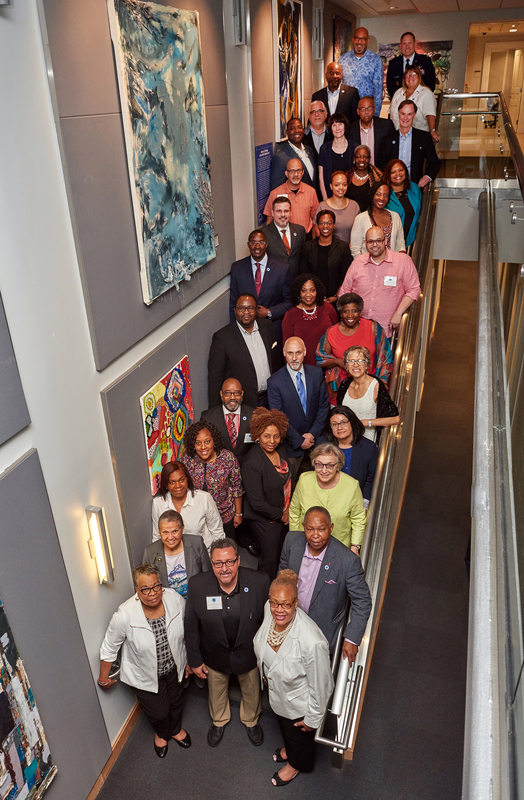 The National Association of Diversity Officers in Higher Education (NADOHE) inaugural Standards of Professional Practice Institute (SPPI), June 14 - 17, 2017, concluded this past weekend with nearly fifty registrants and faculty in attendance. Held at the State University of New York (SUNY) Global Center, midtown Manhattan, participants shared three and one-half days engaging in structured learning and in-depth conversation around best practices and research related to professional competencies for leaders in higher education diversity and inclusion. NADOHE president Archie W. Ervin notes, "This is an historic moment in NADOHE's history. We are excited to have reached this point in our maturation as a national association to conceptualize, design and deliver a program of this caliber and impact. As diversity and inclusion professionals, we are uniquely positioned by our collective expertise and knowledge of best and effective practices to offer guidance and solutions that will move our college campuses and society toward becoming truly more equitable and inclusive communities." Published in the Journal of Diversity in Higher Education (Nov 2014), the Standards of Professional Practice for Chief Diversity Officers (CDOs) continue to advance the professionalization of the CDO role across institutions of higher education. The standards provide comprehensive guidelines that can inform the work of current and aspiring CDOs in providing effective institutional leadership. A link to the standards is available on the NADOHE website, http://www.nadohe.org/nadohe-standards. "The standards are a tool to facilitate the advancement of significant and effective change on college and university campuses by emphasizing the CDO role as an organizational change agent for equity, diversity and inclusion," remarks NADOHE Professional Development Committee Chair, Debbie M. Seeberger, Towson University, who, along with co-chair Juan S. Munoz, University of Houston-Downtown, facilitated the development of the inaugural Institute. The Institute faculty consisted of nationally renowned researchers and practitioners who engaged and challenged Institute participants. Notes Nancy "Rusty" Barcelo, Past President, Northern New Mexico College, "After three days of amazing work on behalf of equity and diversity, I am more energized than ever to continue moving forward. My own thinking has been stretched." Special recognition goes to the State University of New York (SUNY) Office of Diversity, Equity, and Inclusion, that served as the host institution and a major sponsor of the event. Ervin notes, "Carlos Medina, Vice Chancellor and Chief Diversity Officer, Office of Diversity, Equity and Inclusion, SUNY, and his team, including those at the SUNY Global Center, are to be commended for their tremendous support." The Texas Tech University Registry, a national database of diverse faculty, also participated as a sponsor. Plans are underway for the 2018 Standards of Professional Practice Institute and more information will be available shortly. Rosemary Kilkenny, Georgetown University, and Clyde W. Pickett, Community College of Allegheny County, will serve as the 2018 Institute co-chairs. NADOHE serves as the preeminent voice for diversity officers in higher education. Its vision is to lead higher education towards inclusive excellence through institutional transformation. For more information about NADOHE, please call 561-472-8479 or visit www.nadohe.org.